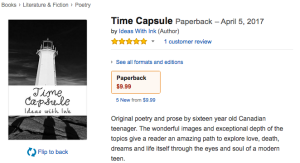 Kindle Edition of TIME CAPSULE available now on Amazon for USD 2.99. Please, download, read, share and review. Your support is much appreciated. I have compiled my first book TIME CAPSULE and it is published on Amazon. The three years of my teenage life, my thoughts, aspirations, troubles, worries and hopes went into this work. I have grown as a human and a writer. Please, share and comment. I value your feedback and support. This entry was posted in Drama, Essay/Speech, Fan Fiction, Images, Novel, Poetry, Short Story on April 13, 2017 by Ideas With Ink. Hi there! I just came across this post of yours and your blog in general and I couldn’t help but comment and tell you how much I adore your blog and love this post! Keep up the great work, I am going to follow you so I can keep up with all your new posts!